Many factors that can affect milk composition and therefore the quality of the milk. Along with environmental and genetic considerations, nutrition also plays an important role for the milk composition. The amount of money a milk producer receives for his milk depends on three factors. Firstly, the quantity of milk delivered. Secondly, the fat and protein content and thirdly, the level of other quality parameters such as bacterial count, number of cells, medication residues and the freezing point of the milk. The higher the fat and protein content of the delivered milk, the higher the price paid. In Germany for example, the agreed price payed by the dairy to milk producers is based on a protein content of 3.4% and a fat content of 4.0%. Every milk producer can adjust the composition of the milk they produce to increase the profit. In addition, changes to the composition of the milk can inform the producer of any nutritional or health challenges faced by the herd. If individual analyzing methods are available, these challenges can also be identified for the individual cow. Nutrition has an impact on milk composition. Cows ferment the complete ration in the forestomach with the help of billons of microbes. 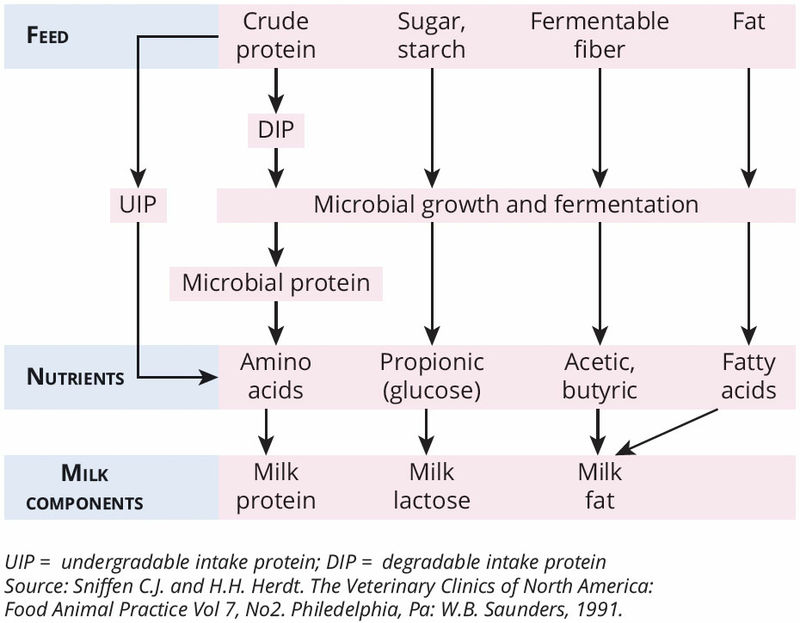 The different fermentation products from those microbes determine the composition of the milk, including milk protein, milk lactose and milk fat (Figure 1). Propionic acid can make up 18% to 20% of the total volatile fatty acids (VFAs) and is precursor the milk lactose content. The content of lactose in the milk is nearly stable, and is therefore of crucial importance for the volume of produced milk in the udder. Lactose secretion in the lumen of the alveoli increases the osmotic pressure on the blood fluids. To equalize the pressure, water flows out of the vascular system. Equilibrium is achieved at a lactose concentration of 4.5% to 5% in the alveolar milk. Even when a ration, deficient in energy is fed, the lactose content of the milk will remain relatively constant. The milk fat content is determined by the acetic and butyric acid production from rumen fermentation, constituting 50% to 60% and 12% to 18% respectively of the total VFAs. Diet and the status of the methanogenic population in the rumen greatly influence the proportion of VFAs. Diets with a high starch content reduce the absolute and relative concentrations of the milk fat (Table 1). From this point of view, a balanced ration is needed to ensure cows produce as much milk fat as possible while also securing a healthy rumen. Rumen acidosis must be avoided. As well as the absolute milk fat content, the composition of the fatty acids inside the milk fat are of interest and can play a role in the interpretation of the health status of a cow. Only 40% of milk fatty acids are produced directly out of carbohydrate degradation in the rumen. The remaining 60% of the milk fat is produced over metabolomics synthase from VFA’s of the digestive tract and free non-esterified fatty acids from body fat degradation. Both milk fat content and composition are therefore influenced by the feedstuffs (fiber, carbohydrates, fats). In addition, the milk fat composition is affected by a variety of complex factors, including the metabolic health of cows. An excess of long-chain fatty acids (resulting from fodder fat and body fat degradation) in the blood limits or prevents de novo synthesis of short- to medium-chain fatty acids. . Milk fat content can be influenced by multiply factors. Several factors influence milk protein production in dairy cows. These factors consist largely of the genetic potential of the cows, how the cows are managed, and the diet. Of all the dietary nutrients that impact milk protein synthesis, energy, as well as the optimal supply of usable crude protein, are by far the most important. Increasing the energy intake of a dairy cow increases both the yield and concentration of milk protein. Understanding how each of the diet components influences milk protein synthesis is critical to maximizing efficiency and production. The type of energy supplied in the ration has a significant effect on lactation performance. Carbohydrate represents the bulk of the energy component in the ration and is present on a scale from non-degradable, i.e. passing through the gastrointestinal tract unaltered, to slowly and rapidly fermentable, which are broken down by rumen microbes. Ruminal carbohydrate fermentation generates propionate, acetate, butyrate and lactate VFAs. Changes in the forage to concentrate ratio in the diet have been shown to influence milk protein yield in dairy cattle. When fed either a high-forage or high-concentrate diet, milk protein yields tend to be depressed, while a forage to concentrate ratio closer to the median elicits a greater milk protein yield. Rations that are higher in more rumen-fermentable carbohydrate can lead to an improving milk protein content without any increase in dietary protein. This is partially through an increase in microbial protein outflow from the rumen, but is also due to an improved energy status, which has been shown to stimulate milk protein synthesis. There are different ways to support high milk protein and fat concentrations, such as maximize feed intake (if needed supported by feed additives), feeding a well-balanced diets and feeding adequate amounts of nutrients. Also important is to monitor diet composition, to harvest and / or buy high quality forage and to use silage inoculants to improve forage quality. As shown in Table 3, maximizing feed intake is the most important factor for improving and stabilizing the milk protein and fat content. Certain feed additives are able to support maximum feed intake, such as autolyzed yeast to increase the number of beneficial bacteria. The beneficial bacteria stabilize the rumen environment (increase the pH) and improve the digestibility of the ration and fiber fractions. This mode of action improves the energy/nutrient supply over a better feed intake, therefore increasing the milk yield, milk fat, and milk protein content. In a trial conducted in Austria with 44 dairy cows (Simmental) with similar milk yield, including ten heifers, received a standard ration (grass silage, corn silage, ground corn, protein concentrate and wheat flour). The 44 cows were separated into two treatment groups. One group received 20g/cow/day of yeast additive* (trial group) over the concentrate. The other 22 cows were the control group and received the standard diet without the additive. 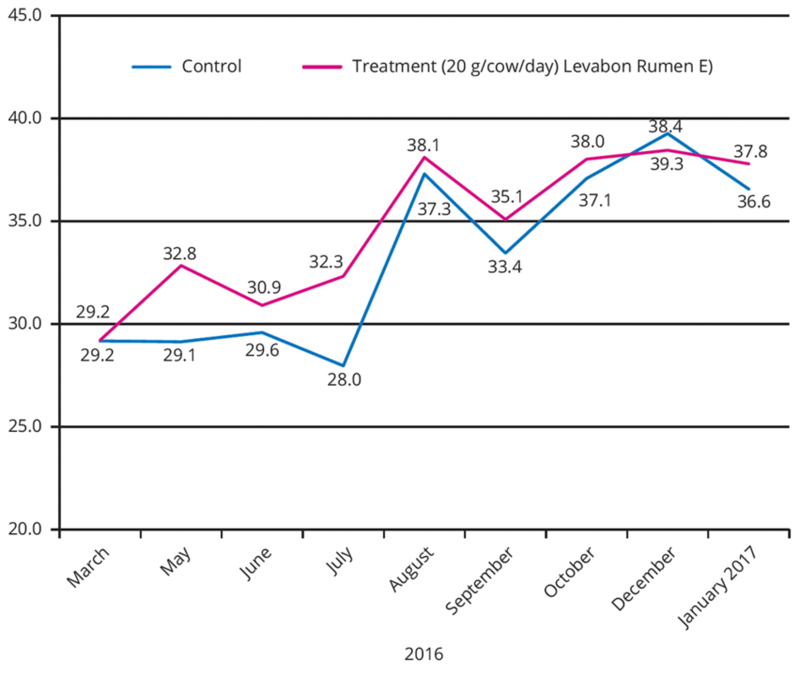 The energy corrected milk (ECM) increased after the start of the trial and reached on average one kg more compared to the control group over the total trial period (Figure 2). The tested additive increased milk yield, as well as led to improved milk fat and milk protein. This result shows that the use of autolyzed yeast can increase the digestibility of the ration and therefore improve feed intake. The result is a better milk yield with consistent milk constituents.